Yet my brother belongs to the land and sky of Phan Thiet. A sand shower whitened his shoulders at the slightest motion. The sea rocking as anxiously as a ship about to leave. Only inches from the water. When I would stand crying alone behind a car. The jungle is still there, the battle ground still there. Nothing can change what is or what happened. The sea is the same deep blue as when you fell. Unaware of news from home, or of your brother's face. And this hill is also our mother's child. I've had to bear all other family concerns. Car horns blare as night deepens in Phan Thiet. Lights of the city show the way for a fisherman. You both have nightly conversations with the sea. In that way, Phan Thiet owns my brother. The cuoc birds cry by the river docks. They cry because the traps are dangerous. Weeds float on the water. More joyful than the source of joy. Cover some of the sadness. Chariots, artillery, horses on distant roads. Only the cries of the cuoc birds remain. Cuoc birds have been crying since before they were named. My father mixed earth to pave the road. He sculpted the kitchen god, a bowl. The wine drinkers left one by one. The cuoc birds cry in the far away fields. young to be woven into mats. Hoping their children would one day look up with pride. Lights often stolen by the wind. You came to me in marriage. Love with its many broken strands and retied knots. Clay for a small tea pot. Just one life, but so much struggle. You gripped the bed, clenched the mat waiting for me. Hoping only that I would return. A torn shirt still smelled good. A small cupboard with a few pairs of chopsticks. We had waited for each other diligently. But it's not true, my love, the cuoc birds cry otherwise. Something makes the cuoc birds cry as though screaming. This morning two neighbors came over. Each time after a funeral. I thought there were no bad people left. I thought no amount of kindness for one another would be enough. But it's not true, Heaven, the cuoc birds cry otherwise. The well laments that so many have wavering feet. After flower season the butterflies go away. I sit, said as a torn lotus leaf. What tortured cries from the cuoc birds at noon. Back and forth until late afternoon. Death pushes us to one side. False fame pushes us to one side. We must cross many oceans to see a smile. We hear the cuoc birds again. But the bamboo walls are thin, and fog kept leaking through. On this cold mountain, I cannot sleep at night. By morning, a reed stalk can fade. White snow on my thin blanket. The stove glows red for lunch, but the mountain remains hazy. I hold it over the glowing coals and it melts into a letter. Blocking the wind, a tree with purple roots trembles. I miss them, but. . .there is an extra blanket. The cold rooster crows lazily in a hoarse voice. We beat on the cups, the bowls, to ease the strangeness. The mountain hides hundreds of ores in its bosom. I try, but can’t find enough vegetables for a meal. The rice often comes early, the letters late. The radio is on all night to make the bunker seem less desolate. I mistake the sound of horse hooves for your footsteps. knowing so, you keep the light glowing late. So rocks would soften, the mountains grow warm. Huu Thinh was born into a Confucian farming family in 1942 in Vinh Phue province, Vietnam. During the Vietnam-American War he served as a tank driver and later as a journalist. 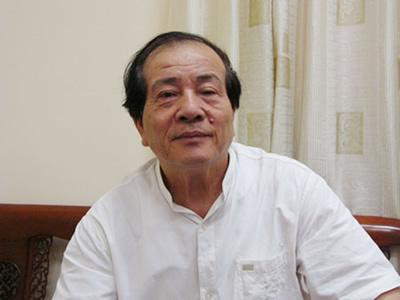 He lives in Hanoi where he is a member of the National Assembly of Vietnam, Editor-in-chief of Van Nghe, and General Director of the Writers' Association. He has published five books of poetry and won numerous awards for his work.